For the two families, decades of searching for answers came down to this: a closed coffin, a bugler's notes, flags folded and handed to them with salutes. The Air Force honor guard, the horse-drawn caisson and the 21-gun salute at an Arlington National Cemetery grave Friday signaled an end to the Defense Department's inquiry into the Vietnam War deaths of Air Force Master Sergeant Thomas Edward Heideman and Captain Craig Brian Schiele. But the military burial on a warm, overcast day served only to quiet the nagging doubts of the two Chicago-area men's relatives, not end them. The Defense Department says the two helicopter crew members died in Laos while rescuing Laotian soldiers during the Vietnam War. After a long, painstaking investigation, the department determined the remains found in Laos and laid to rest Friday were those of Heideman, Schiele and two Laotians. Most of Schiele's remains were recovered from the wreck of the CH-3E " Black Maria " helicopter soon after the 24 October 1970 crash. Those identified as Heideman's were not found until the crash site was excavated in 1995 by the United States military investigators. Though Heideman's mother, Olivette, 92, says she finds " closure " in the burial, his children still question whether the remains in his casket are really the remnants of their father's body, lost three decades ago in the Laotian jungle. "To me, it will be closure, because I understand that his file will be closed," said Olivette Heideman, her eyes filling with tears. "and if that's closed, I'm sure nothing could ever be done after that -- 32 years is a long time to wait. So, hopefully, he's at rest." A report given to the family detailing how the remains were dentified only opened up more questions, Heideman's oldest daughter said this week. "The only way that they came to that conclusion is that they were saying that he was on the helicopter when it crashed," said Mary Ann Buonforte, 46, the oldest of Heideman's four living children, who was at her grandmother's side throughout the ceremony Friday. "There's absolutely nothing in the ... report that is positively identified as being his." Photographs of the personal effects found along with the remains revealed nothing that belonged to her father, Buonforte said. And she and her siblings found nothing of Heideman's when they examined the materials in person Thursday, though one of her sisters took as a keepsake a nickel dated 1970. It was the only thing they could touch to remind them of a man who had only two more years left in his military career when he died. His mother said Heideman, whose 69th birthday would have been Saturday, grew up on the South Side, went to Calumet High School and joined the Air Force after deciding he disliked Northwestern University. "He didn't want inside work, and I had a nephew who was in the service at that time, and he talked to Tom, and Tom decided to join," his mother said. In the next two decades, he and his growing family moved several times, eventually spending three years in Italy before settling in South Carolina, where Buonforte and other family members still live. He was stationed at Shaw Air Force Base there until he went to Southeast Asia in the spring of 1970. One Sunday a few months later, his wife and children were called from church to learn of his death. Since the crash, Heideman's family has never given up hope they might find out for certain what happened to him. His wife and mother both tried to extract something about the accident from the military. "I wrote to numerous people, not recently, but in the beginning, to find out what happened," his mother said. "They couldn't tell us." Heideman's wife, Patricia, died in 1979, and their youngest son died in 1995. As years turned to decades, Buonforte took over the search her mother and grandmother had begun. "About every five years, I would send a [Freedom of Information Act] request to the different offices. Every so often, different things would get declassified," Buonforte said. The misgivings that plague Buonforte and her siblings are shared by many families of those missing in action. Quieting this doubt is one of the roles of the Defense Prisoner of War/Missing Personnel Office, a spokesman for the office said. "Part of the thing is just the human issue that families are concerned. They are looking for closure," said Air Force Lieutenant Colonel Thomas Erstfeld. The process of identification can be long and slow. Buonforte was first told human remains had been found at the crash site in central Laos in 1995. At the time, officials said they might know within six months if they included her father's remains. But the bones were too fragmentary and decayed to yield any DNA, results, and the probe dragged on. In their first determination, military investigators relied on helicopter parts that proved that they had the right accident site, and on eyewitness accounts that placed Heideman on the aircraft, and pointed to him being one of those who died. Originally, Heideman and Schiele's families had planned to travel to Arlington for a group burial on 14 September 2001, but the service was postponed until this week because of the terrorist attacks on 11 September 2001, Buonforte said. 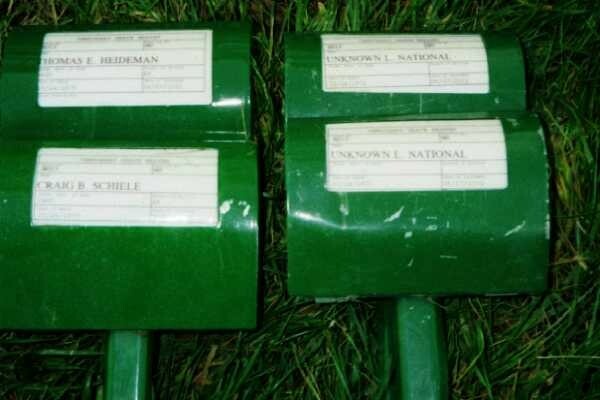 The determination on Heideman and Schiele's remains is in line with many of the 52 Vietnam War MIA identifications made last year by the military, Erstfeld said. "Well over half of the identifications that are made are not based on DNA tests," Erstfeld said. Lynn O'Shea, the New York state director of the National Alliance of Families, a POW / MIA group, criticizes the military for worrying more about crossing names off a list than about finding the truth. "Their goal is to reduce the list of the unaccounted for as quickly as possible," O'Shea said. Despite the lingering uncertainties, the two servicemen's friends and family said they were thankful for the burial. Former Air Force Sergeant Wallace Spivey, the only living survivor of the crash, drove from Philadelphia to see his comrades buried. He still declines to speak openly about what happened almost 32 years ago. "I'm here to honor the guys from my crew and maybe get a little closure for myself, like the families," Spivey said after the burial. Schiele's only sister, Lynne, and his widow, Marjorie Lawrence, said they were happy to meet Heideman's family, Friday, and they were pleased to see Schiele honored. "There is a lessening of the pain, but you never forget someone you loved so deeply," Lawrence said. A former Shaw airman will be laid to rest Friday in Arlington National Cemetery — nearly 32 years after his plane crashed in a Laotian jungle. Master Sgt. 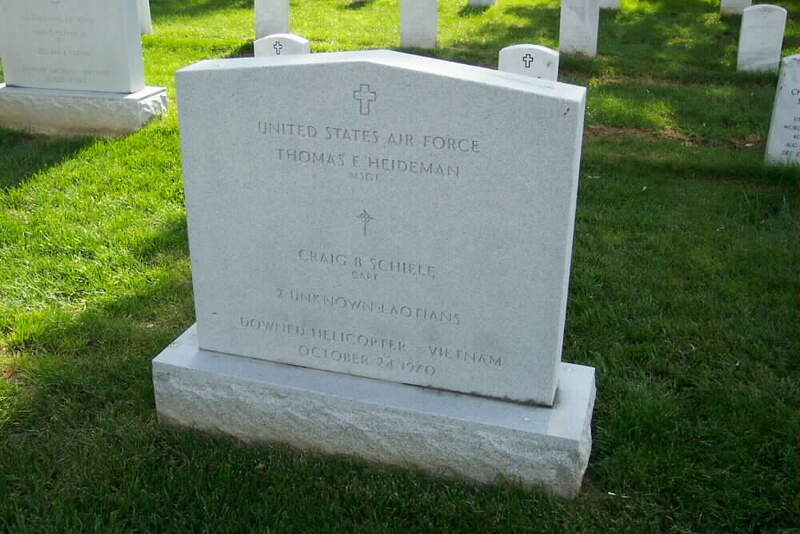 Thomas E. Heideman of Chicago was a crewmember of a CH-3E helicopter sent to rescue Laotian allies during the Vietnam War. Shortly after takeoff on Oct. 24, 1970, the helicopter crashed. A rescue mission the following day identified no survivors. Two more missions followed, including one in 1995 during which 317 bone fragments were recovered. From these remains, as well as other physical evidence such as personal articles, forensic scientists at the U.S. Army Central Identification Laboratory in Hawaii identified Heideman as well as Capt. Craig B. Schiele, also of Chicago. Schiele’s body had originally been recovered the day after the crash. His arm, however, was not found and is believed to be part of the 317 bone fragments. And while many families have agonized about soldiers lost in action during the Vietnam War, Heideman and Schiele’s families have mixed feelings about the recent discovery. Now residing in Columbia, Buonforte was 14 when her father left for the war and 15 when the crash happened. While she says Olivette has yearned for the ceremony at Arlington, Buonforte said she won’t be comforted herself. “This doesn’t give me a sense of closure. This is a group burial, not an individual one,” Buonforte said, voicing doubts that her father’s remains are among the bones found. Buonforte says she has documents that indicate the Defense Prisoner of War/Missing Personnel Office, which led the search, couldn’t perform DNA testing because the bone fragments were burned so badly. Sandy Evans, another of Heideman’s daughters, corroborated Buonforte’s statement. "None of the remains have been identified as him,” she said. “My grandmother donated her blood, but they couldn’t do the DNA testing. But because they assumed he was at the crash site, they went ahead and assumed it was him.” She went on to add that military officials even briefed the family that none of the remains could be identified as her father. A spokesman for the Defense Prisoner of War/Missing Personnel Office, Larry Greer, admits DNA testing was not possible, but remains confident in the other investigative measures used to identify Heideman. “The identification process we used is the same one that’s applied when you have a number of people who died at the same time, like any major airplane disaster, even September 11,” he said. He added that mostly circumstantial evidence — some of which included a “home investigation” — led to the conclusion that the remains were Heideman. Still, Buonforte and Evans remain unmoved. Another daughter, Sumter resident Cathy Long, could not be reached for comment. “They don’t address some things,” Buonforte said. “The conflict in the number of bodies that were seen at the crash site the day after versus the number of people that were accounted for, and all the reports we got from when the crash happened refers to there being three sets of remains found at the crash site, and one was Capt. Schiele. Schiele’s widow, Marjorie Lawrence of Texas, shares Heideman’s daughters’ frustration. But the conversation of the family members quickly turned from their increasing irritation to positive memories of their lost soldiers. The service will be held at Arlington National Cemetery Friday with full military honors. The headstone will have both Heideman’s and Schiele’s names.